After perusing pages of embroidery patterns, I was inspired to quill this Jacobean vine... the flowing layout and scrolls seemed like a perfect fit for paper filigree. It's my only Thanksgiving decoration on display at the moment... eek, I'd best get busy and pull together a table centerpiece. Tomorrow is coming quickly! 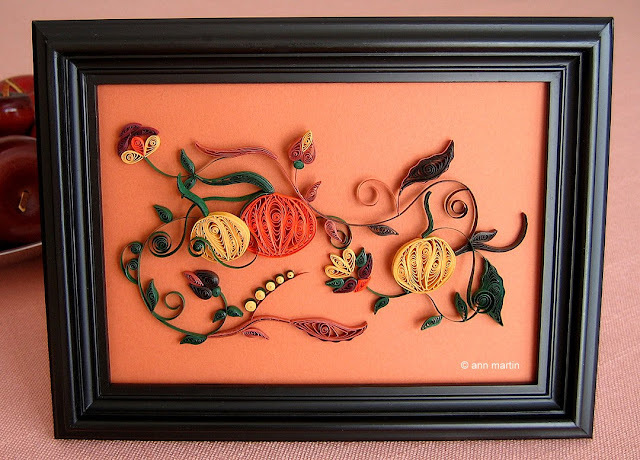 But first, let me say I love working with JJ Quilling line of quilling papers - in this case, autumn shades. They're just the right weight, roll so smoothly, plus have a nice bit of sheen to the strip edges. If you're in the U.S., check with your online quilling supplier as a few carry Jane's papers. And Happy Thanksgiving to those of you who will be celebrating. Once the dinner table has been cleared and the football games are over, I hope you'll find a moment to come back to All Things Paper. I'll be featuring a cornucopia (when does one get to use that lovely word except at this time of year?) of quilled Christmas projects all month long, plus lots more inspiration from the wide world of paper. Gorgeous and I love how you did some of the leaves...very clever. lovely autumal piece, great flow in your design and I love the colours. happy thanksgiving.